Those interested in buying land lots to develop their real estate projects in Sosua and in the North Coast or those buying an house which need renovation works should closely keep track of the costruction costs in the Dominican Republic: at Sosua RE we are happy to assit our customers providing them with up to date information on the costruction activity in Sosua and of its cost developments. The construction cost index for April 2018 was 148.84 up 1% month on month and 7.8% year on year when compared to April 2017. Construction costs are growing in the Dominican Republic faster than the headline inflation rate (7.8% vs 4%). The components of the index that are growing the most in April 2018 were bulding tools and machinery up 7% month on month. 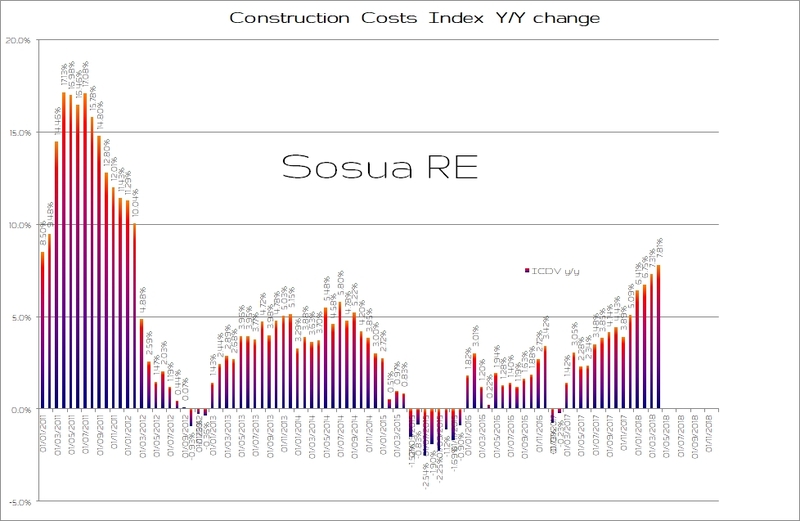 We keep track every month of this index and we update this page on a monthly basis to help perspective buyers of land lots in Sosua to be more informed about the potential developments of costruction cost for their real estate projects.